Podcatcher | Comments, Code and Qt. I've been working with Qt for a while already and we all know what a great cross-platform framework it is. When Nokia bought Trolltech in 2008 it was clear that Nokia wanted to make Symbian development easier. However, the QWidget based toolkit would not fly on Symbian, or any other mobile platform for that matter, so Nokia built some mobile UI frameworks on Qt (and oh boy Nokia is good at building frameworks for everything. Everyone should have at least one framework, if not two. I could write another blog post about that...). But while people in Europe were fighting over their frameworks, it was not until the guys and gals in Brisbane came up with QML when everything changed. Qt could finally be cross platform again and in an elegant way! Symbian just isn't my cup of tea. But that doesn't prevent me from wanting to write something for Symbian if for nothing else other than being able to say I've done it. But just thinking of Symbian C++ or Avkon makes me feel sick. This has changed thanks to QML and especially Qt Components. Also Nokia has finally been able to put out a single SDK that I can just install, write Qt with, deploy the same code on any Qt-based Nokia mobile, publish in the Nokia Store and... Profit! Right? Well, my opportunity to find out came now thanks to my podcast application, Podcatcher for N9, that I've written for the Nokia N9 smartphone. It's has a MeeGo Harmattan Qt Components based UI with a Qt C++ middleware. These are my comments as a former MeeGo developer on the journey to the Qt world of Symbian. There's also a nice video preview of a beta version of Podcatcher on the MeeGo Experts site! And if you have any feature requests regarding Podcatcher for N9, just add them here as comments or email (you'll find the address on the About page). I definitely have some improvements that I want to add to future versions of Podcatcher - the development will go on! Podcatcher for N9 is available from Nokia Store now! 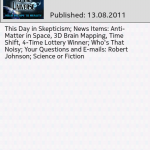 There is a free, lite, version that is limited to three subscriptions only. 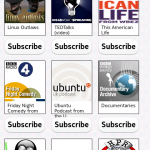 If you like Podcatcher for N9, I hope you will purchase the full version that has unlimited subscriptions. Links to Nokia Store are below. Source code for Podcatcher for N9 is available online too at http://projects.developer.nokia.com/hpodcatcher. 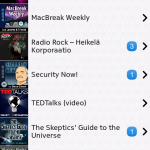 Podcatcher for Nokia N9 is a new podcast client that I have been working on for the past couple of weeks. Because I am an active podcast listener, I found the lack of a podcast client somewhat of a loss when I received my Nokia N950 developer device. There are great podcast client out there that will definitely hit the Nokia N9 via Nokia Store sooner or later, but I wanted to create a client that would fit my podcast subscription and listening needs and that would run great on the Nokia N9. I took some inspiration from previous podcast clients that I've used on Android handsets and I now want to present the results. Finally, I wanted to make the performance of my podcast client as good as possible. The backend of Podcatcher for Nokia N9 is written in C++. The UI utilizes native widget thanks to Qt Components and Qt Quick, while the data is cached into a local SQLite database. This all ads up to some great performance. Please have a look at the screenshots and the video below. I hope you like them!